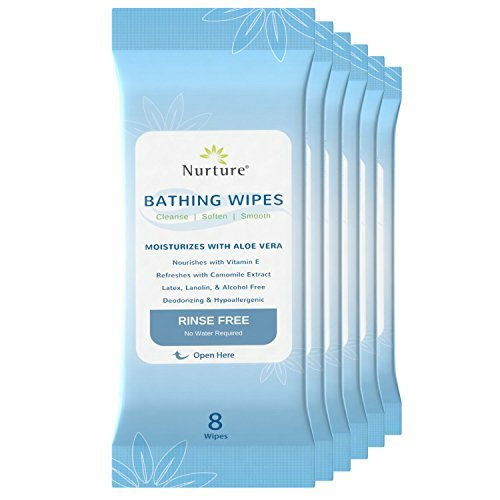 Nurture bathing wipes are PH Balanced, Non-Sensitizing, and Hypoallergenic while also being Latex, Lanolin & Alcohol Free. Great for hiking, camping, backpacking, bedridden & disabled persons, perineal cleansing, incontinence, or any time a shower is unavailable or tough to get to. Nurture No Rinse Bathing Wipes deliver a hassle free, full body bathing experience with absolutely no water required. PH Balanced, Non-Sensitizing, and Hypoallergenic. Latex, Lanolin & Alcohol Free Washcloths. See special offers & product promotions section of this page for savings on multiple product orders. If you have any questions about this product by Nurture, contact us by completing and submitting the form below. If you are looking for a specif part number, please include it with your message.